For 31 years from 1902 through 1933, the ground floor of the Peirce Block on the corner of Center and North Main Streets was the home of the Middleborough Post Office. In 1900 the site of the future Peirce Block at Middleborough Four Corners was occupied by an old wood frame building which had been raised in the early 1800s and which had long served as a store, at the time housing M. H. Cushing & Company, the grocery firm of Matthew H. Cushing. 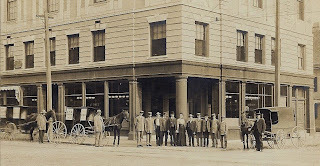 When the owners of the antiquated store building, James E. and Thomas S. Peirce, proposed replacing it with a modern structure, Cushing purchased the Cobb, Bates & Yerxa grocery store in the American Building on South Main Street where he relocated in February, 1900, planning to remain there only temporarily while the Peirce Block was under construction. Typically, the Peirces remained very closed mouthed concerning the entire enterprise, giving few details on the design or the future occupants of their new block. "Nothing will be given out relative to this building, but it is understood that it will be a handsome addition to the business places of the town." One outstanding feature of the building, however, was that it was to be lit by electricity. In the autumn of 1900, the building was wired to accomodate some 200 incandescent lights, as well as two larger arc lights for the ground floor store. This electrical work was overseen by municipal light plant assistant superintendent George A. Philbrook. Because electrical lighting was still a relative novelty, however, the building was also piped for gas lighting, as was customary for many buildings constructed at this time. Prior to completion of the Peirce Block, the Peirce brothers and Cushing appear to have had some disagreement concerning the arrangements for Cushing to tenant the ground floor for it was announced in January, 1901, that "the deal whereby M. H. Cushing & Co., were to occupy the store on the first floor of the Peirce estate block is off." Cushing would remain on South Main Street leaving the Peirces in need of a tenant. In late 1901, rumors began surfacing stating that the Middleborough Post Office was to relocate to the Peirce Block from the Thatcher Block located on Center Street at Thatcher's Row, taking the space originally intended for Cushing. The Middleborough Post Office, for some time previous, had been seeking larger quarters. 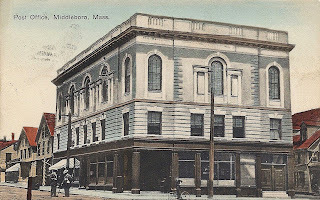 When the Middleborough Savings Bank Building was constructed in 1895 at the corner of Center and South Main Streets, the post office had intended to relocate there, but it ultimately opted not to do so. In 1899, the post office signed a lease on its quarters in the Thatcher Block which it had renovated and altered, and many assumed it would remain there until the expiration of the lease in June, 1904. Consequently, the Middleboro Gazette dismissed the rumors as untrue, though it did add cautiously, "that they have no foundation in fact, for the present at least." Contrary to the report in the local paper, however, the post office announced two months later its intention to relocate into the Peirce Block. "The post office is to be removed from Thatcher's block to the first floor of the new Peirce block corner of Main and Centre streets. The approval of the department authorities at Washington is now awaited." The relocation was strongly agitated by Middleborough Postmaster Augustus M. Bearse who sought more modern and convenient facilities. Additionally, a petition signed by 198 prominent businessmen, professionals and residents supporting the move was forwarded to Congressman Lovering and constituted "one of the strongest documents of its kind that ever went out of Middleboro." The petition was duly approved and the post office relocated to the corner store of the Perice Block, opening for business in April, 1902. "Probably no town of equal size in the state can boast of better quarters or equipment. The post office occupies the entire first floor of the building, which was a recent gift to the town from the late Thomas S. Peirce. The fixtures are of polished quartered oak, with chipped glass panels. Oak desks are placed in the lobby for use of the patrons.... The money order department opens out of the general office and is handsomely furnished. At the extreme left is the private office of the postmaster which is furnished complete in solid oak. By order of the department there will be no call boxes. The lock boxes and drawers are at the left of the general delivery window and number 252. The office is heated by steam and lighted by both gas and electricity." A "swing room" was also provided for letter carriers who were given lockers. Despite the fact that the building's electrical lighting was often cited as a modern amenity, it was not until 1911 that electric lights were installed over the carriers' desks, "which greatly facilitate the racking and routing of their mail." Ultimately, even these new facilities soon became outdated. By the late 1920s, Washington officials had visited Middleborough to scout out a site for a new post office building for the community, finally settling upon the location of the Peirce Academy builidng on Center Street. Despite efforts to save the historic Academy building, the new Federal post office was raised on the site in 1932, opening for business in February, 1933, at which time the Peirce Block post office, which had served the community for 31 years was abandoned. "Post Office, Middleboro, Mass. ", unidentified publisher, postcard, c. 1910. Barely discernible on the plate glass window behind the telephone pole on North Main Street is the lettering identifying the lower floor of the Peirce Block as Middleborough's post office. Scott Catalog No. Q5, 1912-13, 5c Parcel Post. Issued in late 1912 and early 1913, the five cent parcel post stamp was one among a series intended to be affixed to small packages which could be shipped through the mail. Middleborough's first parcel post package was mailed from the Four Corners post office on January 3, 1913, by Postmaster Augustus M. Bearse to his mother in Chatham. The stamps were discontinued in 1913 because their common coloring led the various denominations to be easily confused. 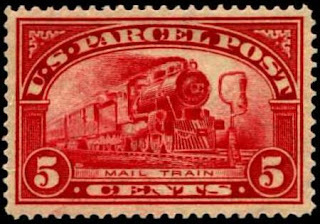 The five cent stamp depicts a mail train. Like elsewhere, Middleborough's mail was initially carried by train, received at the depot on Station Street and transported to the Post Office for sorting and distribution. Much like the stamp, however, this method of mail was ultimately discontinued, automotive transport making mail shipments by train redundant. Middleborough post office workers, photograph, April 15, 1902. The photograph depicts the Middleborough Post Office staff posed outside their new office for a photograph. Postmaster Bearse appears sixth from the right. Note the wagons marked "Rural Free Delivery" as well as the gas light globes of white milk glass which hang over the counters inside the building. 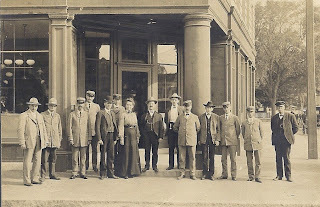 The staff of the Middleborough Post Office, including nattily-dressed mailmen in light-colored summer-weight uniforms and caps, pose outside the Peirce Block office. The workers, from left to right, are Andrew J. Bisbee, Seth A. Eaton, S. W. Guilford, Fred F. Churbuck, Thomas C. McCormick (money order clerk), W. H. Crapo, Mrs. Bertha H. Cushing, Postmaster Augustus M. Bearse, L. H. Raymond, John G. Tinkham, James F. McCluskey (mailing clerk), L. B. Mendall, F. N. Woodward, and Thomas J. Lovell. 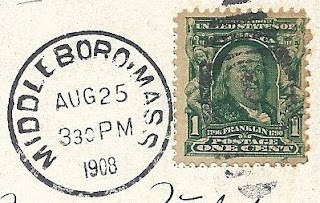 Middleborough postmark, August 25, 1908.